The Chattanooga Times Free Press has learned from sources close to the process that Super Bowl-winning coach Jon Gruden has been extended an offer to succeed Derek Dooley. Sources confirmed that while details are still being negotiated, the university's offer is very lucrative and there is no firm deadline on a decision. 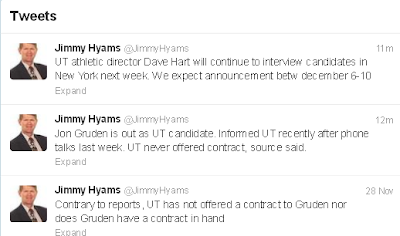 What would a Tennessee coaching search be without breathlessly reported rumors that Jon Gruden might be the Vols' next coach? Earlier this week, rumors swirled that Gruden's compensation package included an ownership stake in the NFL's Cleveland Browns franchise. 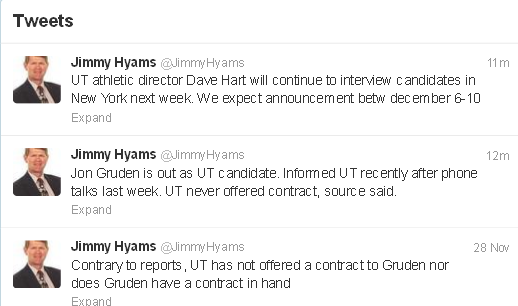 Both Gruden and Browns representatives quickly shot that down. Gruden has been mentioned and coveted in every coaching search since he was cut loose by the Buccaneers in 2008. And every year, he's right back in the booth at ESPN. Is it different this time? UPDATE: Apparently, it's the same-old same-old.